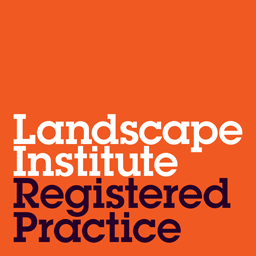 In March 2018, Ebbsfleet Development Corporation (EDC) and NHS England launched an international design competition, managed by the Landscape Institute (LI). The brief: to find the best creative and inspiring ideas to help shape the landscape of Ebbsfleet, the first new Garden City of the 21st Century, and the largest of 10 Healthy New Towns being developed in the UK. 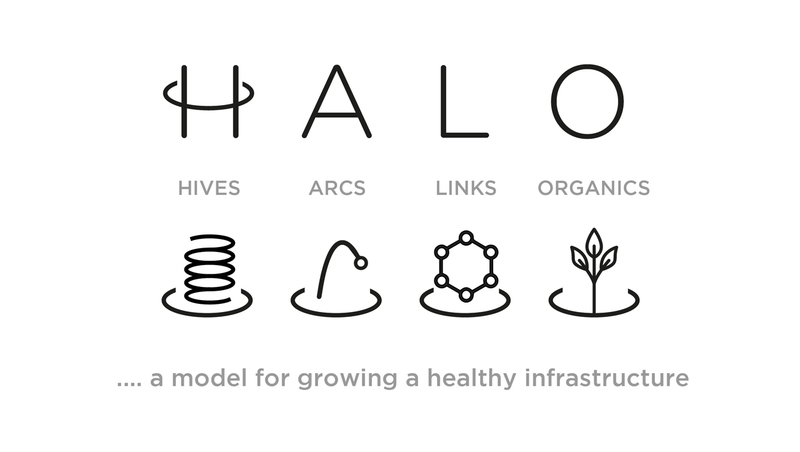 Led by Bradley Murphy Design (BMD) in collaboration with JTP and Peter Brett Associates (now part of Stantec), the winning concept ‘HALO’ re-imagines how the green, grey, blue and built infrastructure work together to make new communities inherently healthier, greener and smarter. With health at the heart of the client’s pioneering vision, early concepts set out to identify and address barriers people face to living a healthier lifestyle. Following a series of design charettes and workshops, BMD and the wider team concluded that the key to truly unlocking health & wellbeing for Ebbsfleet’s residents requires a multifaceted approach. Hives – providing access to others via social hubs; bringing people and communities together to interact, educate and participate in shared activities. 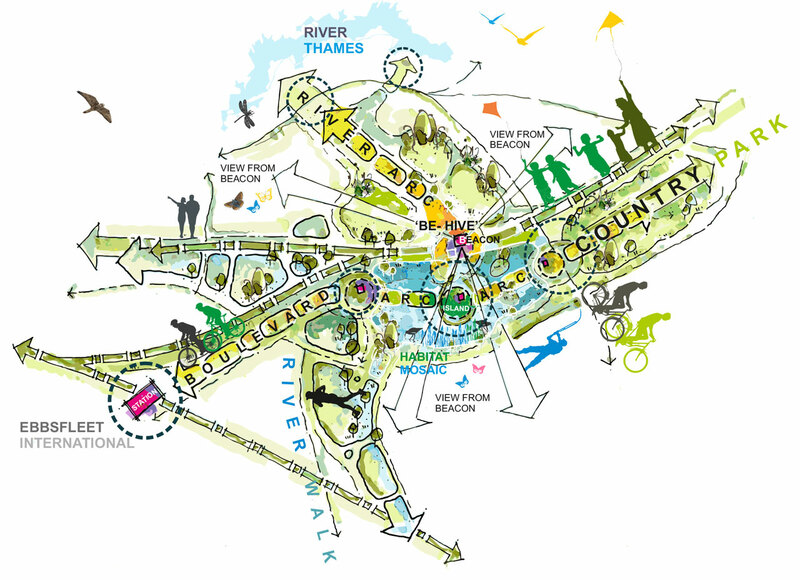 Arcs – reconnecting people to nature via uninterrupted loops that cross roads and railways and connect key parkland destinations. Links – offering a finer grain movement network, ensuring healthy infrastructure is ‘unavoidable’ for Ebbsfleet’s residents. Organics – delivering food and habitat hubs as well as access to foraging routes and engagement with healthy food initiatives such as ‘Edible Ebbsfleet’. 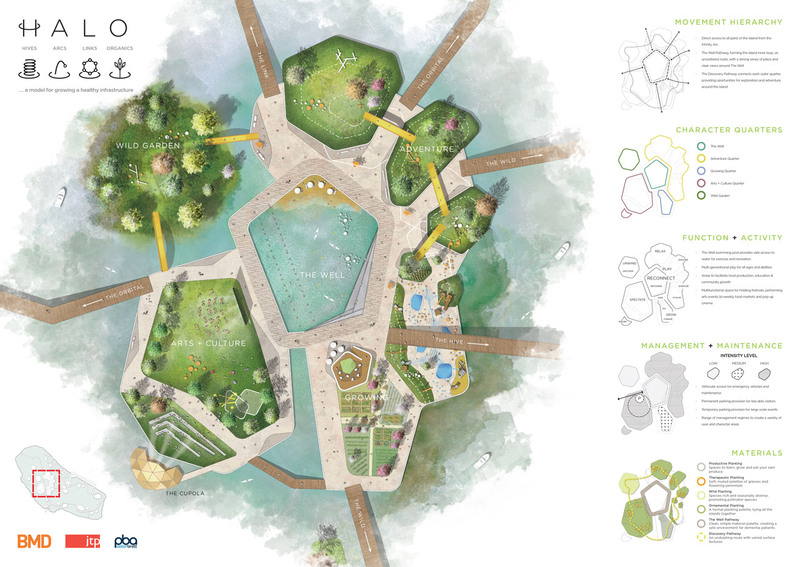 Once shortlisted, the design team were tasked with applying their HALO ideology to the Blue Lake; a natural inherited asset set to become the heart of the new Garden City and one of the site’s seven city parks. 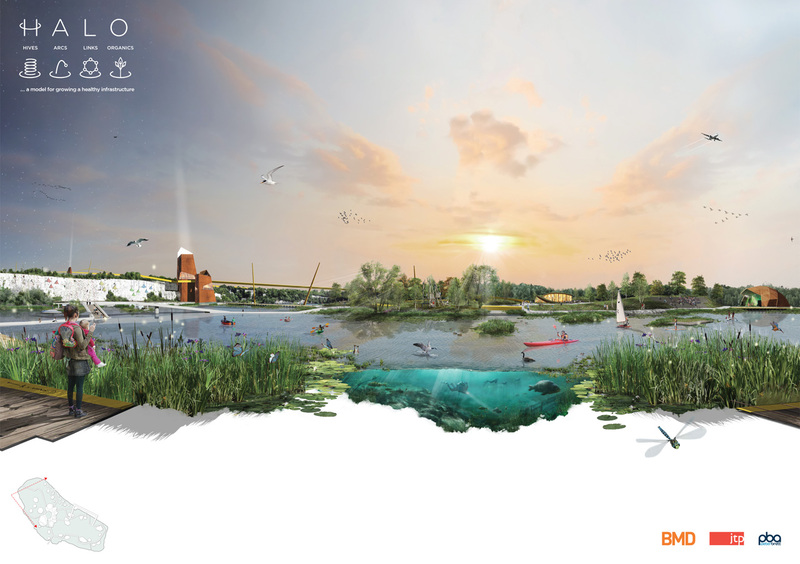 Provide a reason to go there – creating a major leisure destination featuring a floating island adventure park and ‘Be Hive’ beacon built into the chalk cliff face. Offer a safe way to get there – using the lake as a key stepping stone between the development and its surroundings, connected by a series of uninterrupted arcs. Create an accessible & legible destination – allowing people to walk and cycle to the Blue Lake, whilst the beacon ensures a visual connection to the wider hinterland. Providing a connection with nature – establishing a chalk habitat mosaic by enhancing cliff faces & lake edges and the creation of floating eco islands. In the view of the competition’s judges, HALO demonstrated such thorough practicality of thinking that the concept fulfilled exactly what they had hoped for: a design that was radical, but realisable. The panel was also excited by its possibilities, particularly because the design reflected the ‘three magnets’ concept developed by the garden city movement’s founder, Ebenezer Howard. The practical application of the HALO interventions to the Blue Lake demonstrates the model’s adaptability, proving its potential to be rolled out across other towns and spaces across the UK – and beyond.